When Mel Bartholomew developed Square Foot Gardening, he encouraged people to use a permanent planting “grid” on the beds. This clearly divides each small garden into separate sections for planting. It's a fantastic concept, and it greatly simplifies how to space your plants in a square foot garden. I often use grids for planting, though I rarely leave them in place all year. One reason is that I grow large amounts of vegetables year-round (I eat about 8 servings a day), and the grids get in the way when I use slightly larger tools (such as a small spading fork) to mix in fertilizer or harvest my crops. With my damaged hands, I can't use small hands tools very much. The second reason is that I often use different spacing for my plants than Mel recommends. I usually increase the distance between my plants by 50% or more, so my spacings don't always work well with his standard grid of one foot squares. Why don't I follow Mel's spacing recommendations? 1) Given more space, my plants usually grow more vigorously and produce larger crops. If I cram plants together, they sometimes become stunted and don't produce as well. I have never been able to grow a high-quality broccoli plant if I plant them just 12 inches apart. If you give a standard broccoli plant the best growing conditions, it will usually grow more than 2 feet wide and tall. It can then produce a large head, and many edible side shoots. I usually plant them at least 18 inches apart, and sometimes up to 24 inches. With the right variety and good growing conditions – including giving the plants enough room to grow – you can produce these huge beautiful heads of broccoli in your raised garden beds or large containers. Most cabbage plants also need much more than 1 square foot. My standard cabbages often grow 2-3 feet wide! I highly recommend miniature cabbages for small gardens. You can plant them 12-18 inches apart, and harvest tender and juicy 1-2 pound heads. But I was disappointed with the miniature broccoli. They produced very little worth harvesting. Miniature varieties of cabbages fit perfectly in square foot gardens. However, other plants grow just fine planted very closely together. I can usually grow carrots, radishes, green onions, or small Japanese turnips very successfully when they are just 3 inches apart. But my beets grow so vigorously that I need to plant them about 6 inches apart, instead of the recommended 4 inches. Part of the reason is because I built my gardens to provide at least 10-12 inches of topsoil for the plants to grow in. I've noticed that beets and some other plants become partly stunted when grown in shallow soil, such as 8” deep containers. My carrots often thrive in 6-8” deep soil, but not my beets. 2) Some plants will produce larger bulbs, tubers, or fruit if they are given more room to grow, even if they produce the same amount per area. If I have a choice between peeling 1 large potato or 3 small ones, I'll chose the large one every time. I've planted potatoes as close as 12 inches apart – 16 plants in a standard 4′ x 4′ square foot garden bed. I harvested about 30 pounds, but the potatoes were all pretty small. The size of the tubers will vary depending on the variety grown, but it is also affected by how closely you plant them. I've seen recommendations to plant potatoes every 6 inches in square foot gardens! Yikes! That gives each plant very little room to grow. When I experimented and planted only 9 potato plants per bed, 16 inches apart, the tubers were much larger – and I harvested the same total weight of potatoes per bed, about 30 pounds. So I'm choosing to give my potato plants a LOT more elbow room than is generally recommended for square foot or intensive raised bed gardens. 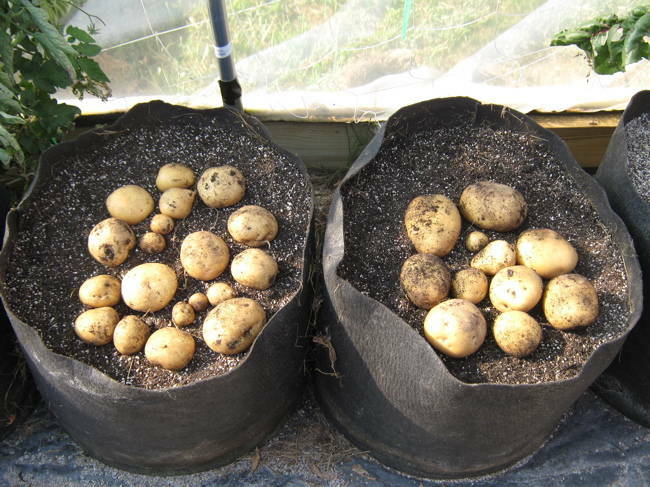 These potatoes were grown in large, 20-gallon Smart Pots. The left pot had 3 Yukon Gold potato plants, and the right pot only had 2 plants. Both pots produced 5 pounds of potatoes, but notice the big difference in sizes! The previous year, I experimented with 5 potato plants in one pot, as is often recommended. I still harvested about 5 pounds of potatoes, but they were so small, I was too embarrassed to take a photo of them! 3) With more space between the plants, you can more easily work among or harvest from your plants with less chance of damaging them. When I planted my bush beans 4 inches apart, I found it challenging to harvest the beans without damaging the plants in the process – the plants were tangled together, and it was hard to spot all the bean pods. Given 6 inches between the plants, I was able to work among them with less risk of breaking or tearing off stems or leaves – and I still had a large harvest. I have had the same problem when I put mulch between my plants during the summer. If plants are too close together, I sometimes damaged them in my effort to tuck mulch between them. 4) Giving your plants extra space will help to prevent the larger plants from shading the nearby small plants. Your garden plants don't know that they are “supposed” to keep their leaves within their allotted area – their leaves often spread well beyond the square you planted them in. You can seriously stunt your small plants by putting them too close to your larger ones. I don't have problems when I grow a large patch of the same crop. All of the plants germinate at the same time, and grow at the same speed. If you space them properly, you will get a big, beautiful harvest. 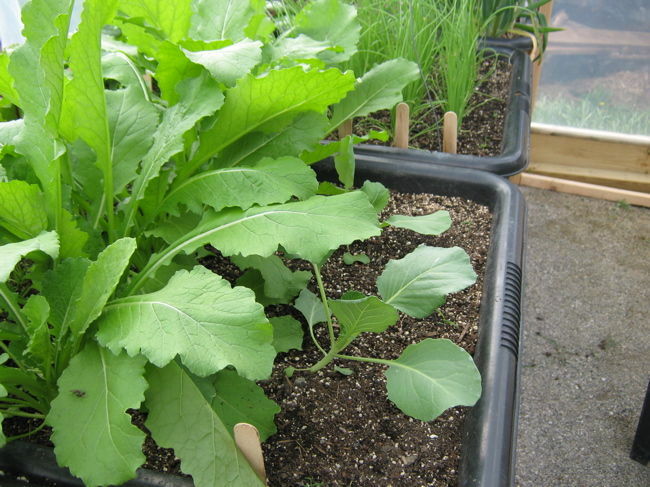 And it's OK to plant small, fast-growing plants in between large, slow-growing ones – such as lettuce or spinach plants tucked in between broccoli or tomatoes. You'll harvest the lettuce or spinach before the larger plants start shading them too much. But if I put a broccoli plant in one square foot, and plant carrots in the square right next to it, I probably won't harvest many carrots. The broccoli will end up seriously shading the nearby squares long before the slower-growing carrots are ready to harvest. I ran into a similar problem in my waist-high growing containers. I planted small rows of seeds for carrots, Japanese turnips, and miniature cabbages. If each of these had grown at the same speed, they would have been fine, as they all had a similar mature height. But the Japanese turnips grew faster than the carrots and mini cabbages. The turnip leaves grew tall and wide very quickly, and shaded their neighbors so heavily, that I lost the other two crops as a result. These turnips are not large plants – they just grow a lot faster than nearly everything else in my garden. So I need to plant these turnips farther away than I normally would from any other crop, and I will also try to keep them on the north side of smaller plants. I planted the Japanese turnip seed on the left side at the same time as the miniature cabbage seed on the right. If all the plants had grown at the same speed, they would have all produced great crops. But the turnips grew extremely fast, and shaded my miniature cabbages so badly that I lost the crop. I would also be careful about replanting very small areas in your raised beds. It is commonly recommended that you can plant and harvest as small as 1 square foot at a time. Unless you are mostly growing very small salad crops, I encourage you to replant a larger area than that. Most vegetables grow to one foot tall or higher. If you harvest a crop in one square foot, and that empty square is surrounded by larger plants, the seeds you plant there may not receive enough sunshine to grow well. It's like being in a small alley, surrounded by skyscrapers! I choose to mostly plant and harvest from areas that are at least 2′ x 2′ in size, so that my young seedlings will receive enough sunlight. 5) When you space your plants farther apart, you don't have to water your garden as often. The biggest disadvantage of square foot and raised bed gardens is the need to water the beds more often than row gardens on level ground. One reason is that the soil in raised beds dries out faster. But another reason is that the closer you plant your vegetables, the more water they will need. So, by spacing my plants slightly farther apart, I don't have to water my garden as often. I also prefer to give my plants deeper soil to grow in. I found that they usually needed more watering if their roots were limited to a 6-inch deep bed, even if I used “Mel's Mix” potting soil recipe. That is why I don't use a weed barrier underneath my square foot garden. I encourage you to experiment with your own gardens. Plant some of your vegetables very close together – per Mel's recommendations – and plant another patch of the same vegetable spaced farther apart. Compare their growth, health, ease of care, and quality and amount of what they produce. You may find your own results to be different from mine, depending upon which plant variety you grow and your own garden's unique growing conditions. I am always experimenting to find better ways to grow my plants. Thanks for the info Debra- Very useful. This is my first year with a sq. ft garden. You’re quite welcome, Patricia. Best wishes with your garden! thank you very much Debra for this piece of work . I am enjoying your advice and videos. Thank you. I am in Alexandria, VA and wondering what part of Virginia you in so I can use your timings of the year comments or need to adjust them. Let me know. I have been using the Mel Bartholomew’s square foot gardening method for the past 2 years. It has worked well in my small city garden area that just barely gets 6 hours sun. I have two 4’x4′ and one 4’x6′ garden boxes or 56 one foot square mini-gardens. Mel recommends, as I am sure you know, dividing each one foot square area with lathing. Hi Tony! I’m glad you’re finding the website helpful. I’m located in southwest Virginia. We are slightly cooler, and have a shorter growing season than you do. You could probably start planting about 4 weeks sooner than us. You also have a much hotter summer. I like square foot gardening, though I recommend deeper soil than Mel does, and I also recommend spacing plants much farther apart. One foot spacing often doesn’t work well for larger plants. Have fun!